CADEX Watch and Accutab Personal Pillbox turns a smart-watch into a practical medication adherence tool to help patients never forget to take their medications again. NEWS RELEASE Boston MA (PRWEB) Accutab Personal Pillbox turns any smartwatch into a practical tool to help users never forget to take their medications again. Today Boston based e-pill Medication Reminders is releasing the world’s first pill box for smart watches. The Accutab Personal Pillbox (Accutab) turns your smart watch into a practical medication adherence tool. Organize all your medications weekly, store them in your Accutab and use your smart watch to remind you to take your medications. This pill box was designed by an arthritis patient, and its simple operation makes it a practical tool for persons of all ages taking multiple medications and/or taking lots of medicines or supplements. 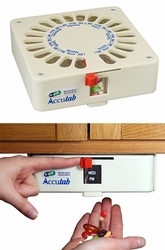 The Accutab Personal Pillbox is a semi-automatic pill dispenser for one person and can be mounted under or inside a kitchen cabinet. 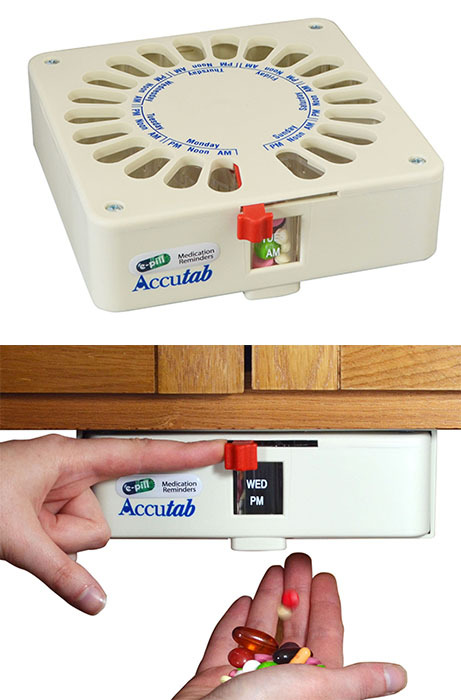 Accutab can dispense all your meds; rx prescription pills, otc medicines or vitamins / supplements up to three (3) per day. Accutab holds lots of medications (up to 25 aspirin sized tablets per medication event – maximum three events per day – fill Accutab weekly). It is easy to dispense medications even for patients with arthritis, simply move the red lever from left to right to dispense all your pills in a medicine cup or directly into your hand. Our Accutab works with all smart watches. You may use the Apple Watch’s daily alarm function or use the Web MD medication reminder function (included with your Apple Watch) to schedule your daily pill reminders. Notifications will include images of the medication, the amount to take, and when to take it. Users will be prompted to log whether they've taken or skipped a dose - alternately they can hit a 15-minute snooze button, or dismiss a notification entirely. The Accutab Personal Pillbox (SKU 820534 / UPC 817475001001) is available today for an introductory price of $39.95 from e-pill Medication Reminders and Amazon.com. Fits right under or inside your kitchen cabinet and is easy to set-up and use. Each unit is 9 ½” x 8” x 4 ¼” and comes with mounting bracket and on-the-go pill box. The Accutab does not require AC power or batteries. E-pill Medication Reminders (legal name e-pill, LLC / Wellesley MA) has been in business since 1999 and offers 53 different medical devices to improve medication adherence / patient compliance and to allow patients to continue to live independently and maintain their freedom. The company’s products (“e-pill medication reminders”) range from pill boxes, electronic pill timers, medication alarm watches to locked automatic pill dispensers. e-pill and ePill are registered trademarks. Accutab is a trademark.